Alloys, a mixture of elements with the characteristics of metal, are resistant materials that engineers are continually looking to develop into more advanced alloys or ‘superalloys’. Reducing: Develop new alloys, which contain less rhenium. Reverting: Re-melt scrap material containing rhenium. Recovering: Remove rhenium from superalloy dust produced during cutting. Recycling: Remove used components from engines, send them back to the manufacturer to be re-melted and cast into new components. 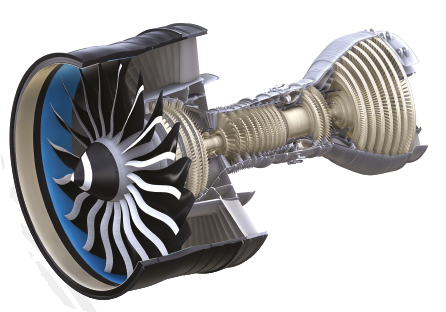 Recycling superalloys like rhenium is essential for the aviation industry developing the next generation of high performing aircraft and engines to improve sustainability and reduce emissions. These new engines require materials that can withstand extreme temperatures without melting. Reducing, reverting and recovering are relatively straightforward procedures that are already embedded in standard manufacturing processes. Recycling superalloys components, however, can prove challenging as they are often used in other efforts like making stainless steel, rather than recycled and used anew. This is because superalloys contain high concentrations of nickel and chromium, two of the main components of stainless steel and rhenium therefore is lost. Industry has the expertise to determine the design and materials necessary to increase production and performance while maintaining product integrity. As competition for the world’s resources increases, it is crucial that recycled materials are used in new products. Recycling policies should therefore be developed and maintained in cooperation with industry to maximise the best use of scarce elements.